There comes a point though, way beyond COBOL, where things start to become absolutely amazing. Once you’re in the realm of mechanical computers and valve resistors, there’s something wizard-like about the people who keep these systems ticking over (often literally) in a practical setting. A dependence on punchcards is the hallmark of the archetypal old-fashioned computer. If you want to portray the fifties, you can simply show footage of an outsized mainframe and thirty immaculate clerks shuffling punchcards and your work is complete. Alternatively, a shot of a Jacquard loom might be all it takes to set a film in the early 19th century. So, it might surprise you to learn that not only are they still in use – they’re in common use, and when they are being used for legacy purposes they’re often being used to bridge the gap with even older technology. Punchcards are used in older time-clocks, and are also still used in voting machines in America. In both cases you might consider the punchcard-powered mechanism far from an entire system – but there are definitely cases where punchcards more than pull their weight, even as a legacy system. Until relatively recently (2012) an entire dedicated and profitable business, Cardamation, existed solely to supply the needs of companies which relied on punchcard-based computers for their work. Their existence is just the most obvious sign that there are many companies using old-fashioned punchcard computers for legacy reasons. But how old is the oldest we can find? A quick search shows that the IBM 129 still has people actively seeking positions. That dates back to 1971, making it a good start in our search for the oldest legacy systems. 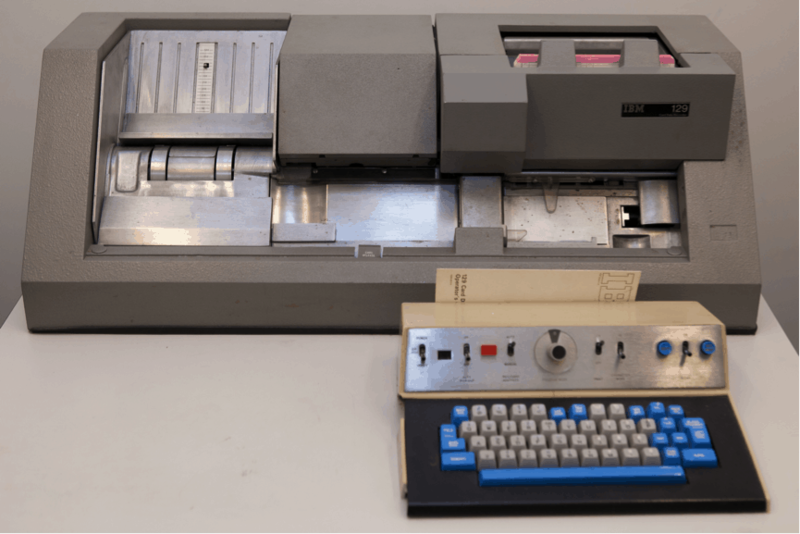 The IBM 129 is a card data recorder, and looks a little clunky compared to many modern machines. Moving further back, and into the realms of obscure one-offs, a company called Sparkler Filters from Texas run an IBM 402, an electromechanical tabulator that uses a plugboard as well as punchcards for a computing experience straight from 1948. Running the IBM 402 requires the use of IBM 029 key-punch machine, which dates back a mere 50 years to 1964. Even in 1964, this represented a way of interfacing with an old legacy system. Punchcards have had a huge effect on programming, with the 80 columns forming a benchmark that has been used in text programs long after they needed to be. Legacy is in some senses a relative term. Programs written in Lisp from the early ’60s or C from the early ’70s would still probably be processed without much fuss by modern compilers and interpreters. However programs written in ActionScript 1.0 and 2.0 are definitely considered to be legacy software. That said, it’s a bit more clear-cut when you have computers the size of a room being modelled in full on modern computers in order to keep them running. Modern military hardware is often older than you might hope, running on systems from as far back as the ’70s. The oldest computers still in use in the military are probably DEC PDP-11s dating back to 1970, enormous computers by our standards, but remarkably compact considering what they were capable of at the time. These enormous computers also still exist outside the military, mostly in order to process and interpret outdated formats, such as old cassette formats, cartridges and enormous floppy disks. This leads us neatly to a third kind of common legacy system, the store of data. Legacy data can be defined as all data storage that requires older hardware or software than that currently in use by the organisation. Legacy data is often essential for legal reasons, or to maintain old accounting data. The problems involved in interacting with them mostly revolve around transferring them from one place to another. Innovative solutions for quickly and efficiently updating data can therefore be extremely valuable to a company. The oldest surviving data storage is difficult to determine, because defining data in a sense that is relevant for modern business is difficult. 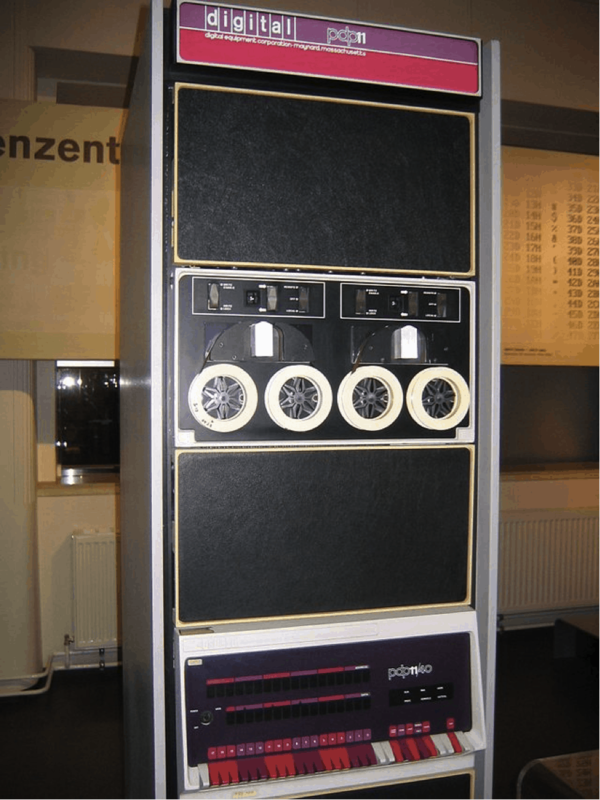 The gap between a punchcard and a written record seems relatively small, even though the gap between modern tape storage and a written record is relatively large. Some of the very oldest forms of ‘data storage’, in the forms of punchcards for Jacquard looms, do still exist – but in museums. Using them to try to program a PDP-11 would probably not be met with approval or success. Possibly the oldest form of data storage for a device that is, in a very very loose sense, programmable, is the speeltrommel of the belfry of Ghent. Not a particularly practical device, but comparable to a more permanent wax cylinder and just as much a form of mechanical data as any player-piano, and it dates all the way back to 1659. Magnetic tape is likely to prove to be the longest-lasting form of digital data storage, with older forms of the medium running on the UNIVAC way back in 1951. It’s still used today – the technology having been refined to the point where vast farms contain acres of tape boasting storage of over 100 terabytes per cartridge. It forms a fantastic solution to modern businesses struggling to maintain large amounts of data, or any situation where you need substantial backup data. Hardly a legacy system, but it’s impressive that the tech has remained relevant for so long. Tape’s survival and flourishing shouldn’t be romanticised too much though – Hard Disk Drives, much more familiar to the everyday computer user than tape, were first used for commercial purposes in 1956 in the IBM 305 RAMAC computer system, a mere five years later. Both have found niches in different types of long-term storage, even as solid state drives are starting to come into their own for convenient modern home computing. Stories of digital transfers are few and far between for some reason, but we’ve come across at least one credible report of a user transferring 2-inch reels of TV shows to more modern media. Why are these legacy systems of interest to an R&D tax specialist? If tech from legacy systems dating back to the ’60s and ’70s is still in use and useable due to effective maintenance, it typically represents a number of challenges to the developers tasked with working with these systems. Legacy computer systems may seem like a relatively obscure topic for an R&D tax specialist to be interested in. However, it’s the complex technical challenges that working with these systems creates that makes them interesting from an R&D tax relief perspective. Working with these legacy systems often builds in an additional level of complexity into any project timeline. The replacement of core systems on which an organisation is reliant is often a hugely costly process, these systems have often been developed over the course of many years, being amended and adapted, sometimes over several decades to remain useable. Integrating these legacy systems into a more technologically advanced setup can represent a huge headache for developers, and there is often a huge level of uncertainty over whether it will be possible to achieve a project’s stated objectives. For external developers and agencies tasked with working with these systems, the technology at the heart of the project may be many years old, but the challenges that these systems represent are often new, and may have never been encountered previously. For the companies still utilising these systems there is a very clear case for development work undertaken to potentially qualify for R&D tax relief, and due to the often costly nature of these projects the relief available can often be significant. R&D tax relief from the government is designed to support businesses in their innovation and can fund future projects. More generally, we see many businesses embarking on ‘digital transformation’. This term is used widely by those companies looking to bring their existing IT infrastructures into the modern IoT (Internet of things) age. This often requires legacy systems (and we’re not just talking those that are decades old here) to be modernised or integrated to ensure they are up-to-date with the latest digital and web technologies. This can include moving to a cloud-based system, the use of APIs, or a more general integration of an existing system into other platforms. Often the fierce competition faced by those operating in the digital space and the increasing demands of users means the need to update legacy systems is both pressing and ongoing. From historical warehouse systems to legacy banking databases, businesses need to constantly strive to improve their customer experience to meet the expectations of modern consumers. One example is around voice search. With the ever growing popularity of voice search and the prevalence of Amazon’s Alexa, Google Home and Siri, legacy systems need to be able to work with these technologies. As we’ve highlighted in this article, when technologies age and are no longer supported, they become more difficult to maintain. By improving an existing system or platform such as an eCommerce site, there’s every chance that you are carrying out qualifying R&D expenditure and moving digital capabilities along as a whole. The benefit of the increased cash flow R&D tax credits bring is not to be downplayed. For businesses embarking on digital transformation, record keeping is vitally important. Good record keeping allows you to record the time staff are spending on qualifying R&D activities and makes it easier to communicate the qualifying spend effectively in a claim. This can help maximise and grow your claims year on year. If you’d like to explore whether your work with legacy systems or platforms can qualify for relief get in touch for a free consultation. ForrestBrown is made up of chartered tax advisers – the gold standard in tax. They collaborate with our software sector specialists, accountants and former-HMRC tax inspectors.